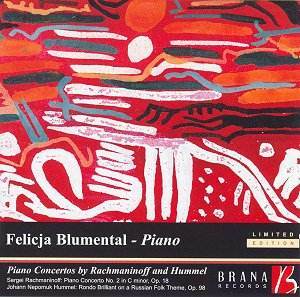 If not a great reading of the Rachmaninov Second Concerto, this 1957 recording by Felicja Blumental is nevertheless highly enjoyable, full of zest and character and certainly well worth hearing. She is usually described as a �Brazilian� pianist, presumably because she eventually made that country her home. She was born, however, in Warsaw in 1908, and died in Tel Aviv in 1991. Blumental was an independent-minded musician, who deliberately searched for neglected or out-of-the-way repertoire, and had a number of works written for her by modern composers. Her approach to the Rachmaninov is fresh, personally conceived, and lacking those mannerisms which tend to accumulate in performances of �warhorse� concertos rather like barnacles on the hull of an old boat. Though her playing seems quite limited in dynamic and expressive range (always allowing for the shortcomings of the recording), there is a great freshness and integrity here, as well as unerring musicianship. The main theme in the finale begins more steadily than we are perhaps used to, yet this allows for a clarity in the cascades of arpeggios with which the composer surrounds his basically simple theme. The great second subject, on the other hand, is taken at a flowing speed, which emphasises its strength rather than indulging its romantic qualities too greatly. The orchestral playing is quite something; I was enraptured by the lovely woodwind in the slow movement, and the strings play with ravishing tone when required, too. The Hummel piece is a light-hearted trifle which needn�t detain us for too long, except to welcome it to the catalogue, and to observe that the folk-theme that it is based on doesn�t sound in the least bit Russian to me � more Polish or Hungarian. Again, in addition to Blumental�s stylish playing, the orchestral contribution is of a very high standard. The recordings are typical of their time, but perfectly acceptable, and have certainly achieved a satisfactory balance between soloist and orchestra.